Tanya Baker of The Boarding House in Chicago, Ill. Photo credit: Eric Kleinberg Photography. Name the top restaurants and dishes that you think every visitor to Chicago should try. Peking duck at Sun Wah. Whole duck carved table side. The carcass is brought to the back and they return with fried rice and broth made with the remaining meat from the duck. You eat the duck with bao buns and all of the accoutrements, a big order of garlicky baby bok choy. Heaven. Breaded steak sandwich at Ricobene’s. The best in the world. Pasta at Davanti Enoteca. I don’t believe it is on the menu any longer, but they had a super delicious pasta with peekytoe crab, uni and scallions. Anything at The Publican. Pork, oysters, beer, charcuterie. It doesn’t get much better than that. Describe your perfect “dining out” day in Chicago. What’s your favorite neighborhood to dine out in? Anywhere that has an outdoor patio in the summer because we cooks barely see the light of day. Pekin duck breast from The Boarding House. Photo credit: IMR. If you had to name one favorite dish from The Boarding House, what would it be and why? 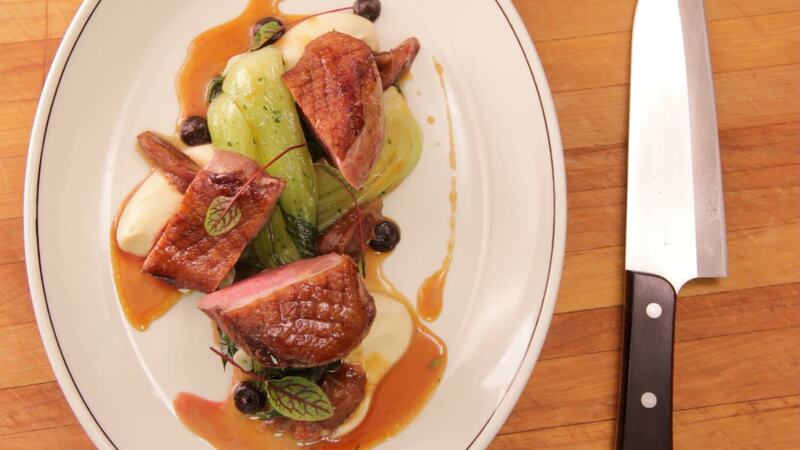 Pekin duck breast with baby bok choy, celery root purée and black garlic. The flavors are all very comforting to me and it is beautifully presented. What other cuisines do you particularly enjoy eating or cooking? My greatest love lies in Korean, Cajun and Mexican cuisines. I still to this day haven’t found a place that compares to my parents’ cooking. I love Cho Sun Ok for their ban chan and naeng myun noodle soup. What’s one dish you tried in Chicago that blew you away and left you wishing you invented it yourself? The queso panela from Nuevo Léon. I’m obsessed. Since Eats Abroad is geared toward travelers, are there any restaurants or bars at Chicago’s airports or hotels you would recommend? I have only been in an airport less than a handful of times. However, anywhere that can fix up a good Bloody Mary works for me. Since it’s Chicago, we have to ask: what’s your favorite place for deep dish? I prefer thin crust over deep dish. Pequod’s and Pizano’s are two of my favorite pizza joints in the city. What is your guilty pleasure and where in Chicago do you go to get it? Chicago hot dog at Maxwell Street. Any favorite drinks and watering holes in the city? A Manhattan from the Green Mill in Uptown, the Stalker from Tiny Lounge in Lincoln Square, and a Michelada from Harbee’s in Pilsen. Are there any foods or drinks native to Chicago that you particularly like and that visitors should seek out? Italian beef and sausage combo! What do you love best about Chicago’s food scene? Chicago is the best city in my mind when it comes to food. We take a lot of pride in our staples as a city, while at the same time embrace other cultures and represent them with authenticity and passion. Finally, what would you say is the one thing any visitor must see or do before leaving Chicago? Ride the El – you will be sure to see some entertainment! The Boarding House, 720 N Wells Street (River North); new American, dinner only Monday-Saturday, closed Sunday. Nuevo Léon, 1515 W 18th Street (Pilsen); Mexican, breakfast, lunch and dinner daily. Canton Regio, 1510 W 18th Street (Pilsen); Mexican, breakfast, lunch and dinner daily. Sun Wah BBQ, 5039 N Broadway (Argyle); Chinese, breakfast, lunch and dinner Friday-Wednesday, closed Thursday. Ricobene’s, 252 W 26th Street (Bridgeport); Italian, lunch and dinner daily, late night Friday-Saturday. Davanti Enoteca, 1359 W Taylor Street (Little Italy); Italian, lunch Monday-Friday, dinner daily, brunch Saturday-Sunday. Second location: 30 E Hubbard Street (River North); breakfast and dinner daily, lunch Monday-Friday, brunch Saturday-Sunday. The Publican, 837 W Fulton Market (West Loop); American, dinner daily, brunch Saturday-Sunday. Cho Sun Ok, 4200 N Lincoln Avenue (North Center); Korean, lunch and dinner daily. Pequod’s Pizza, 2207 N Clybourn Avenue (Lincoln Park); pizza, lunch and dinner daily, late night Monday-Saturday. Pizano’s Pizza & Pasta, 61 E Madison Street (The Loop); pizza, lunch, dinner and late night daily. Green Mill Jazz Club, 4802 N Broadway (Uptown); bar/jazz club, open daily. Tiny Lounge, 4352 N Leavitt Street (North Center); bar, open daily. Harbee Liquors & Tavern, 1345 W 18th Street (Pilsen); bar, open daily. About the Chef: Thanks to her mom’s Korean heritage and her dad’s Cajun roots, Chef Tanya Baker grew up with a sophisticated palate. She recalls a very early interest in food, as well as a particular affinity to Korean cuisine; she always wanted to start the day with her mom’s Korean dishes instead of a bowl of cereal. A trip to Louisiana forged her love for Southern cooking and Cajun flavors. Baker was keenly aware that her curiosity and love for food wasn’t the norm as a child, and when she started looking at colleges, she realized she was the only one seriously considering culinary school among her classmates. She followed through with her plans, graduating from Le Cordon Bleu in Chicago and training at Sangria and LM restaurants in the city. She eventually found her way to The Boarding House, starting out as a line cook. Baker rose through the ranks and in 2014, she was named executive chef. With her promotion, The Boarding House became one of the few restaurants led entirely by women, with Alpana Singh as proprietor and master sommelier and Julia Fitting as head pastry chef.